I am searching here question paper for The TamilNadu Dr. MGR Medical University B.Sc in Nursing-1st Year English Examination ? 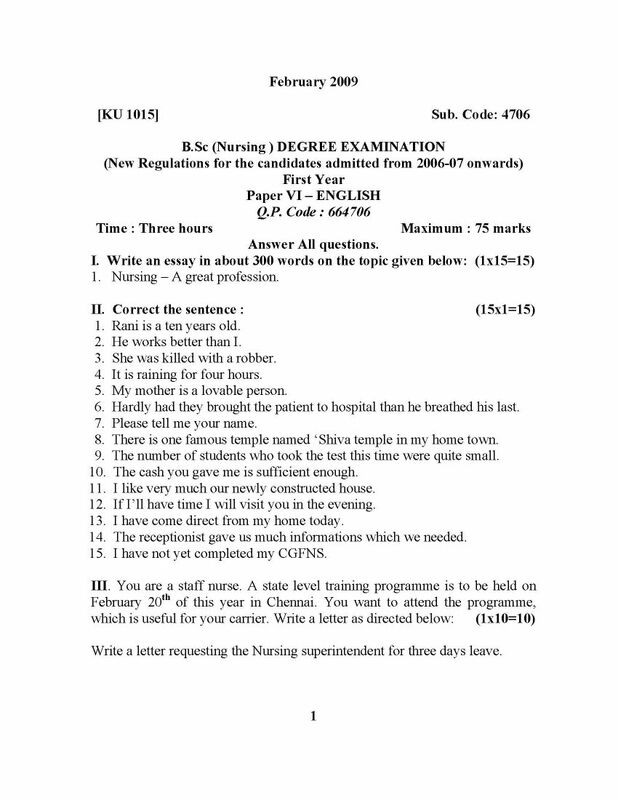 Here I am giving you question paper for The TamilNadu Dr. MGR Medical University B.Sc in Nursing-1st Year English Examination in PDF file attached with it so you can get it easily. 1. Nursing â€“ A great profession. 1. Rani is a ten years old. 2. He works better than I. 3. She was killed with a robber. 4. It is raining for four hours. 5. My mother is a lovable person. 6. Hardly had they brought the patient to hospital than he breathed his last. 7. Please tell me your name. 8. There is one famous temple named â€˜Shiva temple in my home town. 9. The number of students who took the test this time were quite small. i need modal paper. please give me only one paper.